This is going to be a different sort of review, because this is a different sort of band for me. I try to keep reviews impersonal and unbiased as much as possible, but You Me At Six are a band I have a much stronger connection to. They have been my undoubted favourite band for at least eight years now, and have yet to let me down. Every album seems to be better than the last, and Night People is no different. They also have this uncanny knack for releasing new albums (certainly their last three) at times when I really need them; Sinners Never Sleep when I wasn't always having the easiest time adjusting to a new life at university, and Cavalier Youth when I was not enjoying my year abroad in France. And now, Night People, at a time when I've been struggling here in Korea, and have been making some tough choices. Their music has been a continual source of reassurance for me over the years. All of that aside, Night People is a remarkable album. 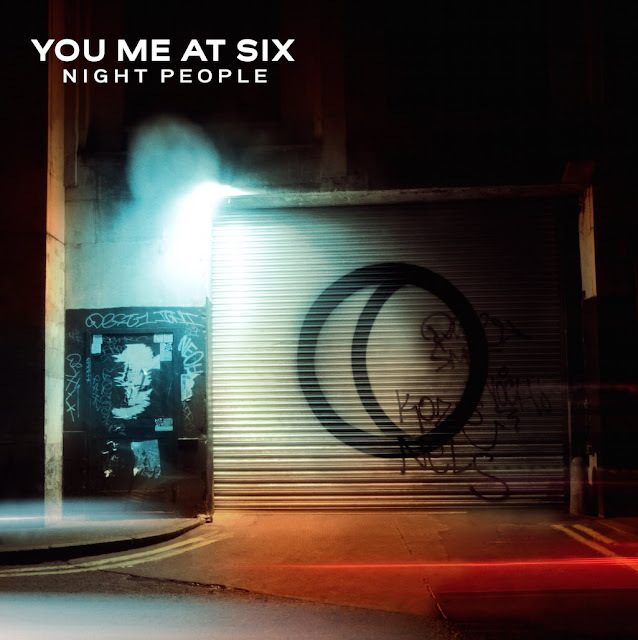 Not content to simply remake their previous material, which has brought them a fair amount of success so far, You Me At Six have struck out to create something bigger, and with more maturity. Every track was written with stadiums and arenas in mind, big, rich, complex tracks to fill the room. They've stepped away, again, from their pop-punk-y roots, and towards a modern alternative rock sound. There's a lot of moody, bluesy tones in this record too, particularly on tracks like 'Night People' and 'Spell It Out'. They retain their catchy hooks and dynamic riffs, making each track enjoyable and memorable. There's a few slower ballads too, such as 'Give' and 'Take On The World', which are just as big and soaring in their composition, and have moved away from some of the slightly clichéd lyrical content of previous records. There's also aggression and determination present on uptempo tracks like 'Make Your Move' and 'Can't Hold Back', reminding us that this is a band not afraid to take chances, and not to be messed with. Initially I was a little disappointed to see that there were only ten tracks, but they've clearly taken care to choose the ten very best, to form the strongest record they could. On my first listen, I enjoyed the record, the style being exactly my sort of thing, and I can appreciate the strong writing and composition behind each song - none are weak tracks. However, much more than that, this record really, truly resonated with me, and profoundly affected me, especially on that first listen. The trio of 'Heavy Soul', 'Take On The World', and 'Brand New' have lyrics which are so perfectly relatable to how I've been feeling recently. Words have always been my medium, and lyrical content, for me, can make a good song great. And to have a band that I've loved for years already write the exact lyrics I needed to hear right now, was actually quite staggering. Not everyone will be affected by this record so strongly, but this can serve as a reminder of how powerful music can be, how it can touch us and change us and help us when needed. I have high hopes for every new You Me At Six record, and Night People most definitely did not disappoint. It's big and ballsy, dramatic and dynamic, and absolutely has the potential to fill the rooms they're aiming for (though I'll miss those small, intimate gigs!). Yet at the same time, this album is intimate, emotional and affective, with real passion and dedication behind each track. It wasn't entirely what I expected, as it is quite a different sound to Cavalier Youth. But it shows they are growing up - a far cry from the floppy haired teens who wrote Take Off Your Colours! - and they're not afraid to experiment with their sound. And perhaps it's because I've grown up along with them, that I like each new record more than the last - though all remain dear to me, even if some more nostalgically now - and why their music continues to resonate with me. And maybe Night People won't affect you as much as it did to me. But I hope everyone finds the music that they need, and that my experience might encourage you to give this record a listen. Trust me, it's absolutely worth it!